Hello Georgia FBLA! I cannot believe that Fall Motivational Rally just happened a few days ago. I cannot wait to celebrate the kickoff for this amazing year with you. As summer is coming to a close and the leaves are starting to fall, hopefully your local chapter is starting to get serious for conferences and competitive events. There is one more thing that your local chapter should start to get serious with: Chapter of the Year! Last time, I showed you ways to earn points by showing you how to have the best chapter, members, and advisers in the state. This month I am going to show you how to earn points by telling/showing Georgia FBLA in your community and the activities you could do in your local chapter. Lets’ go back to the chapter planning guide and look at the Chapter of the Year entry form and go to the Public Relations Activities section. The subsections that I am going to be focusing on this month is Publicity, FBLA Publication Submission, and Submission of FBLA Chapter Pictures. First, let’s dive into the Publicity subsection. Your chapter can receive points for appearing in school and local community articles. You can also for receive points for television/radio appearance; and additional, you can receive points for developing a chapter website and a developing social media page. Then, for FBLA Publication Submission, you can receive points for each article you write in Tomorrow’s Business Leader and the Georgia FBLA website. You also receive points for completing a page for the Georgia FBLA scrapbook. Lastly, you can receive points for liking the Georgia FBLA page on Facebook. The final subsection I am going to be talking about is Submission of FBLA Chapter Pictures (my personal favorite). You can receive 2 points per picture when you send it to Georgia FBLA. For sending pictures of your local chapter you can receive Chapter of the Year points! I hope my tips will help you get the ball rolling for Chapter of the Year. With Chapter of the Year, starting early is the best policy so you can receive bonus chapter of the year points. Next month I will be exploring the other subsections of Public Relations Activities. If you have any questions about Chapter of the Year, you can email the state adviser Monty Rhodes at monty@georgiafbla.org. What is American Enterprise Day? What is so special about November 15th? This date salutes and publicizes the American free enterprise system and teaches others about it! This is a great time to recognize how valuable our free enterprise system and get get involved in the celebration. Check out the “Get Ready for American Enterprise Day” article for ideas! We can’t wait to see how you and your chapter celebrate, so be sure to tag us and use the hashtag #GAFBLA! Fall has just begun and everyone is feeling festive. Opportunities to give are coming up. 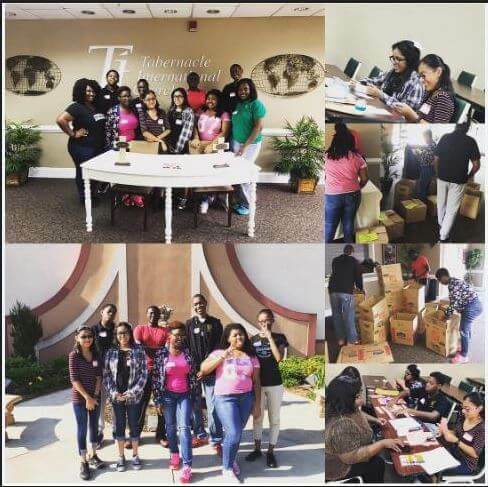 On Saturday, September 23, Shiloh FBLA went to Tabernacle International Church for a community service event from 9am to 1pm. Members contacted people in the community and worked on marketing flyers to inform them about the upcoming Harvest Time event. Members also boxed perishable foods for families who will be in need during the Thanksgiving holiday. FBLA students love to give back to the community and always appreciate opportunities to help others. Halloween Social/Party: Nothing beats the traditional Halloween social. It’s a fun event that will help attract new members while helping them get to know the other members of your chapter. Having members donate candy and other snacks lightens the load on the chapter budget, and you can have members help with the decoration and setup. This is a perfect and easy afterschool activity that promises fun and new members. Haunted House: Nothing brings members together like a trip to a local haunted house. Organize the trip and encourage members to bring their friends. As they get know each other through the trip, they will be more inclined to join your FBLA chapter. If visiting the haunted house trip isn’t enough, you can even work with your chapter to create your own haunted house and give discounts to members which would entice more people to join to get the discount. The seasons have changed–fall leaves, pumpkin spice lattes, and the infamous carving of pumpkins. This shift of seasons obviously co-asides with the shifts we are about to have in our meetings. You have come to the right place to look for your third meeting tip of the month: keeping up with the seasons. What’s better than having themed meetings after the seasons we are in? The seasons bring a variety of emotions, and fun activities that one can incorporate into their meetings. Since it is October, you can incorporate one of the infamous things that are associated with October. Besides that, you can even have door prizes for your meetings that are October themed. Even after October, you can still incorporate the different seasons into your meetings. Activities with seasons are endless to where if your chapter has multiple meetings during a month you can still let the seasonal activities be involved in your meetings. This type of shift in the meeting setup can leave members excited to attend the next one, give you new ways to keep your meetings fresh and innovative and leave the members feeling the wonderful effects of the seasons shift. Try it out with your own meetings, and see the wonderful outcome it can have. Check out next month’s Meeting Tip of the Month for more tips!